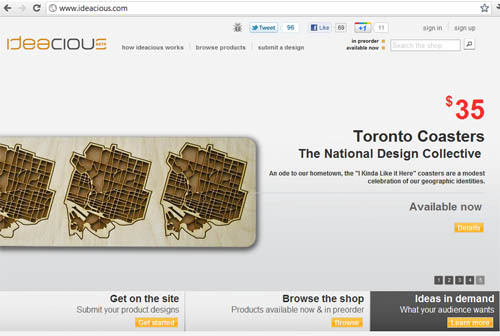 The National Design Collective: IDEACIOUS! There is a cool startup company here in Toronto called Ideacious that you should check out. They are a little bit like Kickstarter, but in my opinion better. They allow anybody with an idea to get some feedback and design/manufacturing assistance to bring it to the masses. Once the details are worked out between the Ideacious team and the inventor, it goes up for presale on the website to raise funds for production. The best part is that everyone who buys in early gets a piece of ownership. When more are sold, the early adopters actually make money back as a reward. They also have a nice online shop that sells cool stuff from designers all over the world, including some of our own!